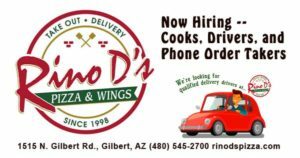 Rino D’s is Now Hiring – for Cooks, Drivers and Phone Order Takers! Just click here to apply online! RINO D’s DELIVERS BEER, WINE, and PIZZA!! Call us directly to place your order! For these deliveries, EVERYONE must be at least 21 years old and will need to show their ID before signing the delivery log book when accepting delivery. And, for a limited time only, receive a free koozie with every delivery. …and don’t forget about our Specials, and, for that special event, we have Catering! Thinking about working for Rino D’s Pizza? Rino D’s Pizza & Wings was established in 1998 by Andy and Katy Dell.This family-owned pizzeria is named after Andy’s grandfather, Rino. Rino was born in Castelunovo Del Friuli; a small town north of Venice. Their love of great food, made only from the freshest ingredients and hard work, is the main reason for Rino D’s success. Welcome to Rino D’s Pizza & Wings! 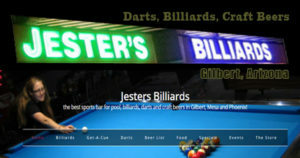 billiards, darts and craft beers and great food! in the Encore Plaza in Gilbert, Arizona.